BEFORE: I have very mixed feelings going into today’s advanced screening of Cloud Atlas. There have been a few trailers released including an extended six-minute trailer and lots of positive buzz from the screening from the Toronto International Film Festival. The film, like the novel it is based off of, and which I haven’t read, is a very complex and confusing story. Starring Tom Hanks (last seen in A League of Their Own) who has six roles, Halle Berry who also has six roles, and Hugo Weaving who again has six roles. I’m cautiously optimistic going in. I want the film to be good because, even though it’s an adaptation, it’s original. Like Christopher Nolan did with Inception, Tom Tykwer and the Wachowski’s are assuming the audience is smart and educated and catering to that as opposed to your basic blockbuster-explosion-fest. But I can’t help but think this is a bit too ambitious to pull off. I guess only time will tell. AFTER: If Cloud Atlas does one thing, it makes you reconsider things you take for granted. Watching this film, I made connections to two separate media: Carl Sagan’s Pale Blue Dot and the Battlestar Galactica quote “All of this has happened before, and all of this will happen again.” These two connections relate to two of the biggest questions/revelations of Cloud Atlas and they are: Earth is very small when considered on a universal scale; and why do we keep making the same mistakes over and over again. Keep these ideas in mind as I go on to talk about how the film played out. I won’t lie to you. Cloud Atlas is very confusing, long, and hard to follow at times. Lots of people will complain about this and have a problem that there’s too much talking and not enough action. Inception made audiences think as well but it was much more appealing on the outside that Cloud Atlas is. This being said, I enjoyed it very much. The effort put into this film is incredible beyond belief. If there ever was an A+ for effort, Cloud Atlas is the epitome. Tykwer and the Wachowski’s had a difficult road ahead of them but they made it through. Even if you don’t like the film, I think it’s hard to argue the amount of work and dedication it took to complete this project. There were a handful of minor problems or complaints (some scenes, especially early on, it is almost impossible to figure out what is going on because you are just bombarded with bit after bit of new information), but the overall picture and the effort that went into this film, far overshadows these minor issues. I will note here that despite any confusion you might have in the first 20 minutes or so, stick with it. As you begin to see more of these characters and the environments their stories are unfolding in, you begin to make sense of what is actually going on. Major credit must be given to the actors. Of the six main leads (Hanks, Berry, Broadbent, Weaving, Sturgess, and Bae) there must have been at least 20 to 30 characters divided amongst themselves. It’s incredible work, not only on the acting side which must have been incredibly demanding, but also on the costume and makeup department. There were quite a few times where I didn’t realize that one of the characters was actually one of the main actors (Broadbent’s and Sturgess’ gave me the most surprises I think). On that note, make sure to stick around for a little while into the credits where you can see short clips of all the characters each main actor played. I guarantee you’ll be surprised by a few of them. I think the choice is easy as to whether or not you should see Cloud Atlas; a resounding yes. Many people won’t like this film, you may be one of them, but you really should give this a chance. 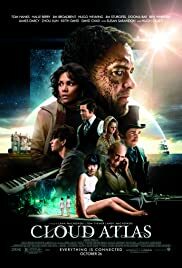 Cloud Atlas is a highly ambitious film and the sheer amount of effort that went in to this needs to be recognized. Sadly, I don’t think this will win Best Picture, it’s just not the type of film that does, but it is still entertaining and very enjoyable to watch even with a runtime just under three hours. Cloud Atlas opens in theaters this Friday, October 26.